Despite a reputation for reaching for their revolvers at the merest mention of culture, the Nazis were among the most ruthless, avaricious and methodical art collectors ever to cast a greedy eye and thieving hand over other people's property. "Use every means of transport to get all works of art out of Florence … [save] works of art from English and Americans," ran one of Heinrich Himmler's orders. "In fine get anything away that you can get hold of. Heil Hitler." That appetite for the most beautiful and precious works of European art saw thousands of pieces stolen from their owners between 1933 and 1945 and entire collections raided, scattered and lost. The quest to recover them and, where possible, return them to their rightful places has been under way for almost seven decades. Now, thanks to a deal between some of the world's leading archives and museums, an online catalogue of documents has been created to help families, historians and researchers track down the missing artworks. 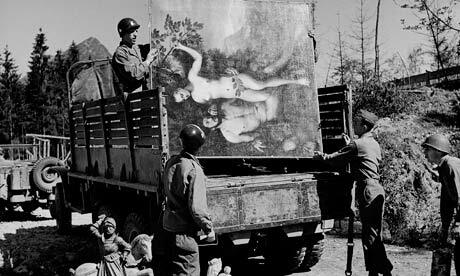 Under an agreement signed on Thursday by organisations including Britain's National Archives, the Commission for Looted Art in Europe, the US National Archives and Records Administration (Nara) and Germany's Bundesarchiv, the records will be available through a single web portal. The records include files documenting the systematic expropriation of Jewish property, Adolf Hitler's plans to establish a Führermuseum crammed with looted art in his Austrian hometown of Linz and the interrogation of art dealers. The British documents, which cover the years 1939 to 1961, also lay out the efforts made to identify the stolen works and reunite them with their owners. Among them is a report from a British art expert and RAF intelligence officer who was dispatched to Switzerland in 1945. The paper may have faded to yellow, but Douglas Cooper's exasperation with the Swiss authorities remains fresh to this day. "Until I arrived here five weeks ago, practically nothing had been done," he writes. "And still no steps have been taken by the Swiss government to put the looted pictures in security. This means that it is still possible for any of the present holders to dispose of them." Cooper concedes that "a new spirit seems to have made its appearance" since his arrival, but appeals for Foreign Office support in ensuring that dispossessed owners do not have to make individual claims through the Swiss courts "because the issue is a moral one". The National Archives and the Commission for Looted Art in Europe have worked together for two years to catalogue and digitise more than 128,000 pages of information, ranging from seizure orders and inventories to images of looted works and reports of the transfer of stolen pieces to neutral countries. All the original British government files have been scanned in colour and are searchable by name, place, subject and date. The aim of the enterprise, according to Oliver Morley, chief executive and keeper of the National Archives, is to provide unprecedented access to the past. "By digitising and linking archival records online, researchers will be able to piece together the stories of what became of cultural objects, be they books, paintings, sculpture, jewellery or any other stolen artefacts from evidence fragmented across borders and languages," he said. Anne Webber, co-chair of the Commission for Looted Art in Europe, said that while records from the UK, France, Belgium, Germany, the US, and Ukraine were now accessible online, other countries – including Switzerland, Poland and Italy – also held documents that could help families and historians. "It's been enormously difficult for families to access these records because before you had to physically go to them," she said. "But now they're all digitised and you can search by the name of the victim, the perpetrator, the artist and the artwork. It will dramatically change the possibilities for people, but there's still more to come."